Mask attack is an irreplaceable tool when you know a fragment of the password or have any specific details about it. For example, when you know that the password consists of 12 characters and ends with the qwerty, it is obvious that searching the entire 12-character range of passwords is unreasonable. All what would be required in this case is to recover the first 6 characters of the sought password. That is what the mask attack is for. In our case, we could define the following mask: %c%c%c%c%c%cqwerty. That means that the program would serially check the following combinations: aaaaaaqwerty .. zzzzzzqwerty. If the original password is 'secretqwerty', it perfectly hits our range. 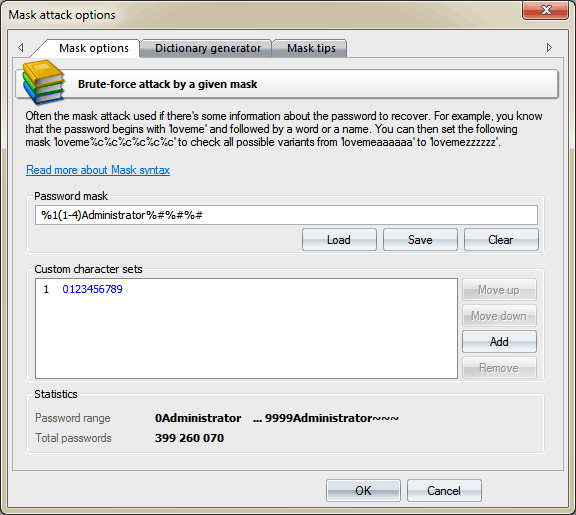 The mask entry field is used for setting the rule, by which the program will try to recover the password. If the mask is set correctly, below you will see the range of characters generated by the mask. User-defined masks can be saved to disk. You can also use the mask tool to generate a dictionary (may not be available in some editions). The mask syntax is quite trivial and consists of static (unmodifiable) and dynamic (modifiable) characters or sets. Dynamic characters/sets always have a leading %. For example, if you set the mask secret%d(1-100), the program will generate 100 passwords (secret1, secret2: secret100). %r(x1-y1,x2-y2...xn-yn) set of several non-overlapping sequences of UNICODE characters. %1[..9](min-max) user-defined range of variable length (from min to max) to brute-force. You can set up to 9 your own custom character sets. When setting %r, keep in mind that the range of defined OEM characters (with character code greater than 127) is generated using the DOS encoding. By switching to Dictionary generator tab, you can generate your own dictionary by a given mask, and save it to disk. However this feature available in the Advanced edition of the program only. The third tab of the mask options contains a short description of the mask syntax and a couple of simple examples.